I can remember back in the days when I was doing “heavy” touring, you know the kind that takes you away from home for 4 months, or where you go away for 2 weeks and return for one, and keep repeating that pattern, just how hard it can be on someone. Not to say it doesn’t have its many rewards, because it surely does, but one must learn to tour in as “healthy” a manner as possible. This is important, because touring itself is notoriously un-healthy! I think with the advent of being in a much more health-conscious era these days, young touring players would be a little more self-preserving then the folks I recall touring with back in the ‘70s, ‘80s and ‘90s! Although, I must admit, the running craze really caught on in the ‘70s, and a lot of us used to love to make running a part of our road regimen. That was also fun because we’d get to know new places, cities, rural areas, whatever it might be, and we’d be able to explore them with the jogging we’d squeeze in whenever we could! It actually got kind of addicting, and we’d challenge and compete with each other. This all means of course, that the better shape you’re in before you tour is critical, and that if you can maintain an exercise discipline during the tour you’ll simply keep staying in the right shape. Rest is critical, and you never really know what kind of stress and high-energy you are putting yourself through until you eventually come home, and notice how you’ve really changed! I can recall after my first truly extended tour in 1975, with John Prine, a grueling episode for sure, I came home like a different person. I was short-tempered, snapping at everyone, and was physically and mentally a wreck! And most of the time I thought I was just coasting along. Truth of the matter was I was under enormous stress and tension, the likes of which I was even too young to recognize at the time! The other band members were shutting me off, the music was basically terrible due to them, and I was not digging the musical blend of me with them at all! This also translated into personality clashes as well, and nothing can make a tour more unbearable than that! Obviously, it would be good to get along with each other, and I mean really get along, because even the best of buddies can end up fighting and clashing with each other on the road. It’s just something that happens from the close quarters, close performing and other factors. Being on the bus for extended periods of time can also really take its toll, especially when it’s the bus where you’re very often going to sleep. It really took me some getting used to sleep on a moving vehicle while being in a crowded bunk. It was like always having to get used to sleeping lightly, as opposed to sleeping deeply and soundly. So I got used to really trying to catch up on “real” sleep whenever we were lucky enough to have a real Motel or Hotel to stay in. So all I can say is I want to make sure you don’t have to go through so much of the hardship I had on the road. I’ve done it all, from sleeping on the floor of my band’s van, to staying in 5-room suites with Simon and Garfunkel, and I hope you get to experience the full spectrum of touring, especially the good part! At the stage now where I am putting all the finishing touches on my new album. It’s a very exciting and even thought provoking time for me, as it helps give me ideas of what to pass on to you! Certainly, it’s very important to keep an honest perspective on any recording project as it moves along, especially as it comes down to the wire. After all, we all want to have our projects turn out to be the best they can be, but sometimes we can get to caught up in all the details, and we can “nit-pick” a bit too much! This is a normal reaction as we get closer to the release of our beloved recordings, and I’ve learned, I think even more from this new album, how to really systematically get more down to the nitty-gritty when it comes to making decisions. The truth is, the complexity should really start to diminish as you keep going with more and more mixing and fixing, but what I have found is that as the time moves along, and I live with the music more, I discover more and more little tiny things that even though they bother me, used to be things that I’d end up living with! Now, I know how to recognize what irks me, whether it’s a lick, a drum sound, a wrong bass note or whatever else it could be, and to finally address this in the later processes of mixing and fine-tuning the project. In my early days of recording, and I’m sure yours too, all that recording equipment, the atmosphere and the basic vibe of being “under the microscope” can really be a bit scary and “off-putting” until you get enough experience so you feel that confidence you need in the studio. This is the only way you’ll really be able to stay “on top” of your music, and keep your ideas and decisions level-headed. With this all under your belt, you’ll surely have a better finished product in the end, and best of all, you’ll be truly pleased with yourself, knowing you never let yourself down by giving in to the wrong decisions, or even worse, getting into the habit of “settling” for lesser performances and sounds! After all this is your music, and it deserves having you put your best foot forward. I certainly feel that this time, I’m definitely doing that with my new album, and will be totally satisfied with the final product! Can’t wait for you to hear it! Summertime release! This new album I am doing has gotten me thinking more about my role and your role as an instrumentalist in this world of many players! As guitarists, we have to wear many hats in this life, but when you are a true instrumentalist, which is one major way of how I think of myself, the guitar playing and what you are “saying” with it becomes ever so more important. I find that as time goes on, I am always honing my craft, and learning that the old cliché of “less is more” becomes truer and truer. I mean after all, there comes a time when we can certainly feel as if we’ve “peaked” at a certain skill level for ourselves, but in my opinion the artistic side seems to always grow. You have to come to a realization point in your playing where you understand that what it is you want to say creatively really is what matters, and what will eventually set you apart from the pack. In the case of my new album, I have discovered so many new tones and levels of expression that I never, ever considered for recording, yet they are just so right. Recording has a funny way of sometimes “boxing” you in, and it certainly can do that for me too, but this time, perhaps more than ever, it’s been a “freeing” experience. It certainly started by having just about the finest bass and drum combination one could ever hope for. My usual drummer, Shannon Ford, had to do an 11-month tour with his wife, Alice Ripley, the actress. They were taking her hit Broadway show, “Next to Normal” on the road, and knowing I had a new album to make, it was making me “next to insane” to think about who would replace him on drums! I had always missed and longed to play again with my old friend, the great drummer Mike Braun, but simply thought he was too far away, and too bust to get. My friend told me, “hey, why don’t you just look him up? !”, and lo and behold, there he was on Facebook, living in Oregon, and just done from a 20-year stint with Hall and Oates. He was available! That changed everything, as I could now have my all-time favorite drummer, matched with my wonderful, “in the pocket” bass player, Eddie Denise! What a section they made! We cut 11 kicking tracks in just 3 days, and I couldn’t have been more satisfied! Add to that 2 terrific tracks I did with Shannon before he left, along with the great bassist John Previti, plus one more solo acoustic piece I did, and it’s done! The interesting thing about this project is how diverse I go to play, while somehow keeping it all together as a true work that exists in this place and time. I think it will stand the test of time for sure, and as an instrumentalist, it is one of the most satisfying moments when you realize you’re truly happy with something that will speak for you long after you’re gone! This is what we all, as guitarists, should strive for! More Thoughts on Being the "Sideman"
The years I had as a sideman, or “hired gun” as I’ve also heard it called, proved invaluable to me as a guitarist in general, and also as a future “front man.” It is a very proud and often “unsung” part of the music industry, this role of making others “sound good” through your backup work, but believe me, it can work wonders for you and your career, especially if you do get the recognition you deserve! And the only way to get that recognition is to do well! I only know one way of making music, and that is to be 1000% committed to it, and as dedicated to it as possible. The minute I hear a song, and I know that I am soon to be a part of it, I will always give it my all…whether it means laying out, or overplaying to do the right thing! In the end, it really does communicate with the audience, and hopefully, the performer you are being the “sideman” for really takes notice of the wonderful job you are doing for them, and most importantly acknowledges it! It’s so important that we feel at least recognized and rewarded for doing an exceptional job musically, and that others don’t let petty jealousies and other nonsense stand in the way of you getting the proper accolades you deserve! If you take on any sideman jobs, do not be too choosey. You want to be known as an all-around player, and also as someone who takes on challenges, as opposed to one who passes on them! This kind of negative reputation can really spread quickly, and can truly put the brakes on an otherwise well-advancing career! People write me all the time, saying that they’ve gotten a certain gig, but they want to leave it because they hate the music! I’m sorry, but these days, where there are easily at least 1000% more great guitarists around than when I was starting out, you’ve got to be glad to get almost any gig you can take. Now, if a better one comes along, and offers you more financial stability as well as musical and artistic happiness, then of course, by all means take on the new gig. Just don’t make too many people hate you in the process, because everyone ends up re-tracing their steps to a certain degree in this business, and more often than not, you’ll run into old acquaintances again. So remember also, being a “sideman” will always lead to helping you be a “frontman” one day, and it’s been the case for so many artists for so many years. The ones who were once “hired guns”, usually end up being the nicest to work with, and the ones who will understand and recognize what you do for them the most! It’s an exciting night, as Johnny A., Gene Cornish, Jimmy Vivino and myself will all be playing at the Iridium in NYC tonight! Who knows what to expect, as it always is when you get these kinds of players together, but for sure, it will present some pretty interesting, as well as challenging musical moments! 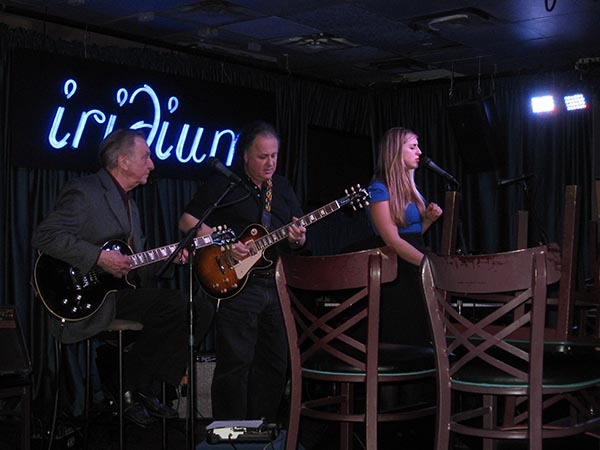 The Iridium has really proven to be a Mecca for guitarists everywhere since Les Paul set up shop there some 20-plus years ago, to do his regular Monday night appearances. It became a worldwide phenomenum, and guitar fans from around the globe would stop by to always pay homage to the man himself, and to pay tribute to the guitar! Well, tonight will certainly be no exception, as we all try to continue the tradition. All this at the same time we are making a Les Paul Tribute album w/documentary, of which my daughter Lexie sang on, as well as me playing Mr. Sandman! Johnny A. is always fun for me to play with, as is Jimmy Vivino, who I go way back with, and Gene Cornish, as a member of the Rascals, and my friend, is always a pleasure to play with! My daughter, Lexie, may also come by and sing a couple of songs, since she and I appeared there with the Les Paul Trio a month ago, and it should sound fantastic! I’ll be keeping you all up to date on this musical experience for sure, so look forward to future Blog entries about this! Wish me luck! Getting my new album ready now, and all of a sudden, there’s that kind of “empty” feeling that occurs when you realize it’s almost completely done, and you’ll have to really promote it and bring your music to the masses! It’s a little bit of a scary feeling, because when you “come down” from the “high” of doing so much creativity and music, the very thought of now having to deal with things basically on a business level, well, it gets pretty daunting. Personally, I am looking forward to the challenge, but for me, it’s always the one thing that has held back my recording career. I’ve done lots of records, 12 solo ones so far, gotten lots of airplay, never really toured enough, and simply never had the record company backing that I deserved. These days, the business has totally changed. One good thing is that we can all now do much more “self-promotion”, on things such as Facebook, YouTube, MySpace, Twitter and of course, our own websites. I mean when I hear an artist I am interested in, my first thought is to “Google” them, and to look up their website to find out more about them, and how I can get their music. There are websites where you can put up your music, and even get paid for downloads of it, such as “Band Camp” and others, and of course, you can keep track of all this too, far more easily than in the old days of having to trust record labels, many of whom could never be trusted in the first place! Still, however, if you really expect to make a true impact, you must have people on your team. A real promo person for the press and internet, and a promo person for radio are really essential if you want to make the kind of “splash” you really deserve. When I see a well-known artist who is always busy with things, I immediately think about how much must be going on behind the scenes for these people. They are, after all, “mini industries” in their own right, who support legions of workers, have offices, booking agencies, and many promo and legal people at their beckon call! Obviously, when it comes to record labels these days, much of that has changed, and there are very few, who even if they have signed you, will actually spend money on “tour support” or other important ways of backing an artist. So, the era of being truly “independent” is here….I will be using promo people for sure, but I will also continue to build up my fan base and followers on Facebook and the like, and hope that it all translates into record sales. And oh yes, don’t forget….the biggest record store in the world now is a table, right after you’ve played your show. That seems to be the magic moment when everyone wants to leave with a little part of you, known as your music! Sometimes, in this difficult economic environment, we see that even major “established” performers who were normally parts of, or who carried bands, have to go it solo! There’s certainly nothing wrong or especially new about this concept; there have been great solo performers forever. Many of these performers went the other route, such as Bob Dylan, who was greatly criticized by some for leaving his solo Folk-style performing for his electric band-oriented performances! But these days, many folks, even myself included, have enjoyed “branching out” and doing some truly focused and intense solo guitar performances. I know that I love it, and that the thrill of having that pure “control” of oneself as well as the audience, is truly one of the real payoffs of doing a solo show. I find that the audience gets even more into it, as they are forced to really “listen” and pay even closer attention to each and every subtle nuance of what you are delivering. You can suddenly stop, for example, yet the audience will still keep the beat for you, while you can even play some lead guitar over their handclaps! There is just a much better sense of “space” and the art of controlling it with one guitar. This is a very powerful feeling, and it’s important to not feel as if you must fill everything up with notes! Yes, they will be impressed with technical prowess, fast playing and the like, but it’s also the subtle and quiet things they will enjoy too, such as a solo bent note, a harmonic, or even tapping rhythms on the guitar. Take a look at what a guy like Tommy Emmanuel can accomplish in front of a live audience with just one acoustic guitar….he gets the house rockin’, and at the same time can make you cry. This is what I love doing with one guitar in front of a crowd, and there’s nothing like that feeling of “winning” a big crowd over, or having an intimate musical “conversation” with a small crowd in a bar. I’ve also had the pleasure of literally “stealing” the show as an opening act for a band. The crowd comes in, they don’t know what to expect, and before you know it, they’re enraptured by the fact that just one solitary person is up there, giving it his all, and making a heck of a lot of music come out of one box! So, even though we love the friendly confines of having a band, and other musicians to “fall back on” in live situations, there can be no feeling like going it alone, and standing up there onstage, and proudly delivering it all in one concise, small package! I hope you give it a try one day; it’s one of the most musically rewarding things anyone can ever do! Feedback, Gibson and Other Muses! Working on finishing up my new album these days, and I’ve been having an absolute ball using various guitars for many different tones. This applies to the original tracks, as well as my overdubs, and the two primary Gibsons I’m using are a 1964 ES 330 and a relatively new Les Paul Traditional. I have been finding these to be extremely useful and creative guitars to use in many applications, and I even just used the 330 in an overdubbed part that consists mostly of a kind of controlled feedback that backs up the vocal, as well as gets used in the solos and “ride out” of the song. It’s really a cool effect, because first and foremost, it is not an effect, but rather a carefully played part that one can listen to and focus on throughout the entire song, as it weaves in and out. I find that I’m discovering new things about the “controlled” feedback even as I’ve been recording, such as using it for raga-like “drones”, connections from one guitar part to another. Harmonies to the vocal and many other very, very cool applications! Of course, this all comes from the fact that it is a true hollow body guitar, that wants to feed back even at fairly low volumes. And those great old P90 pickups really answer the call when it comes to that thick and bluesy tone I’m going for in conjunction with the feedback! Then, enter the Les Paul, and we have a real feast of thick and wonderful tones that truly run throughout the entire album, and work very well together. I find that I’ve been loving the Les Paul on all three settings for many different reasons; the middle position (both pickups) is great for rhythm parts, and I’ve been doing a lot of arpeggio finger-picked parts combined with tremolo from the amp, which really thickens up some truly soulful parts! I’ve also found, in regards to the Les Paul, it really works well on some very “up” parts at the ends of songs for that big “ride out” part that may be needed. And if you think of some of the great songs of the past, such as “Layla” and other Clapton, Page or Allman endings, they are truly great uses of the true “Les Paul” approach! So some of this album definitely has that classic vibe, while on other tunes, I am going for far more contemporary and unique approaches, especially within my own tonal spectrum. Thanks to some classic Gibson tones this is all being made possible. Can’t wait to debut some of these tracks for you all! Playing in the Iridium in the Glow of Les Paul! There’s nothing quite like stepping on a stage that has incredible history, and every time I do that at the Iridium Club in NYC, I am reminded of the large legacy and shadow cast by the great Les Paul at that place! This is an historic club, where Les made his Monday night appearances for so many years, and it’s the second location of the Iridium, with the first one having been further uptown by Lincoln Center. I did get to play with Les at that first iridium, and even saw him play at the old Fat Tuesday’s back in the ‘80s. Whenever we did anything together, even like when we performed together at Tramps for the Danny Gatton tribute concerts, it was a truly memorable and powerful moment! In a few days, I will get to perform there again with Rusty Paul, Les’ son, along with other guitar friends of mine, such as Gene Cornish, Johnny A. and Jimmy Vivino. I should be a total blast, and I look forward to this immensely! It’ll be a totally different experience musically, and I think a lot of what we’ll be doing is “winging it.” This is no problem for us, seeing that there will be literally hundreds of combined years of musical experience and knowledge up there onstage, and I’m sure anyone can call out any kind of tune, and we can handle it! These are really the kinds of moments you as a guitar player should live for, and is always a good idea to do, especially in terms of getting out there and receiving more exposure. I’ve certainly been doing a lot of these kinds of musical happenings lately, and it’s really quite invigorating when you can go from many days in the studio to suddenly being onstage somewhere, and playing either what you just recorded, or what might simply just come to mind! Either way, you’re always expanding your musical scope and knowledge, and I certainly recommend this kind of activity! So, once again, the legacy and rather large shadow and glow of the wonderful Les Paul will shine down on us as we play the Iridium once again, and as we keep his incredible history, music and amazing contribution alive! I want you to have similar experiences too, and to really get the most out of your performing and recording life. Remember, you have your own legacy to leave! The art, (and it truly is!) of being able to sing while playing can be a real challenge for many people. There are certain instruments, or more accurately, styles of playing, that are more condusive to being able to properly accompany singing. Usually, if you’re a lead guitarist, as I am, you have to be able to bring your part down to a more minimalistic approach if you expect to be able to keep playing while singing. You can see the many approaches by different musicians and how they have it worked out. For example, the great Levon Helm, who I did an album with 3 years ago, is simply amazing in how he sings while playing drums! It’s true that it’s a “rhythm” instrument, which usually makes it easier to sing with, but he manages to play through the fills, and all the complex parts he likes to play! Paul McCartney represents perhaps the quintessential “singing while playing” example, as he is someone who went from being a guitarist/singer to a bassist/singer in the biggest band of all time, and who became one of the greatest singers as well as bass players ever! This is especially impressive in how he is so adept at playing melodic bass lines, while singing melodies that are seemingly totally unrelated! The other extreme is represented by the great B.B. King, who literally slings the guitar aside as he sings, which also adds to the dramatic effect of his vocals, and then only concentrates on his lead solos as well as fills. It’s a very dramatic effect, and it’s become literally a “signature” approach of his that he has developed to a fine art form! So try the various approaches, and there are many….you’ll know when you reach that comfort level in regards to playing and singing at the same time, and of course, when you have other players to rely on, you can also work on being able to leave some space, and to truly be the “lead” singer, as well as the “lead” guitarist! Best of luck!